On this design I had some inquiries from Australia, and one guy in the US is working on it. 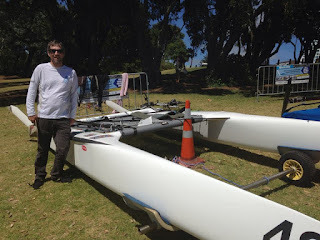 The first Wave Piercer SurfsSki / Kayak I saw was Magnus de Brito Point 65 Bourbon Orca. Nelo has now released an Olympic K1 with a wp profile , but I need to check cross section to see if its pure cosmetics. In flat water racing I can see a wp bow cross section resutling in less pitch motion on the paddlers movements and cadence, if you look closely to K1s they are constantly submerging and floating up on paddlers rythm , specially at the start. Thus a flatter bottom section might reduce that providing a better support on the paddling down force and re direct that inertia into a more forward motion. In any case this wp Surfski is an open water design, I'm an amateur ''designer'' and all my written thoughts have to be taken with that in mind, So in my view this Surski wp shape (cross section mainly as tried to explain in this wp/volume distribution article) might deliver a good paddling drive specially in short chop upwind as well as downwind and surfing chop/waves in open waters, which is basically the mode Surfski races are held. This is a proto to prove the concept, thus a shorter lenght and little wider for better stability, we made some CFD tests with Ralph Moolenaar against a the reference Epic and results were quite even: catsailingnews.com/2013/03/design-surfski-mv605wp.html. 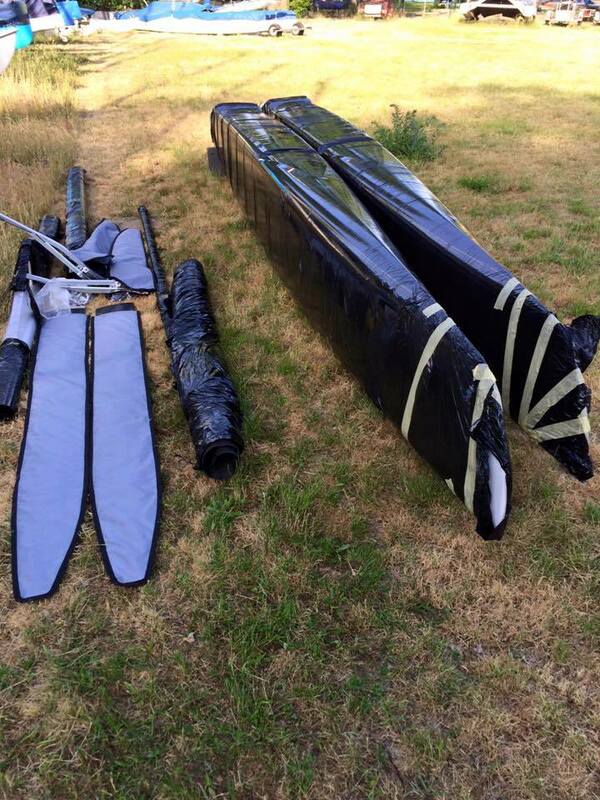 Next project to be built is a Racing 12'6 SUP. The East Coast Piers race is a long distance sailing event for fast dinghies and catamarans. 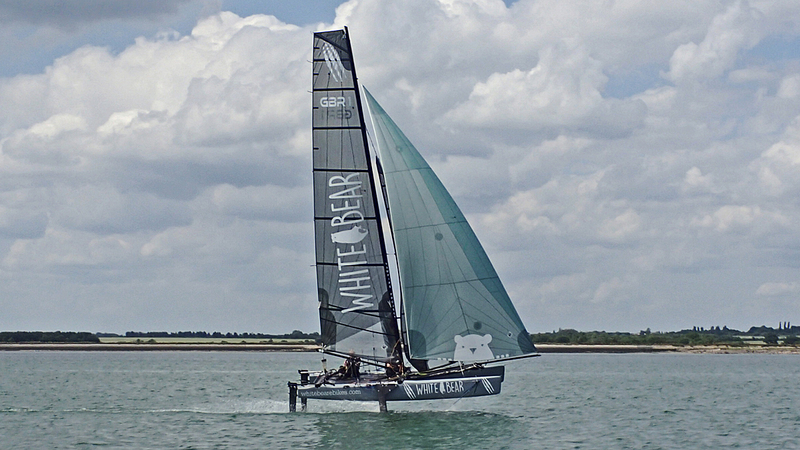 The race weekend raises money for The Cirdan Trust and Essex Air Ambulance. 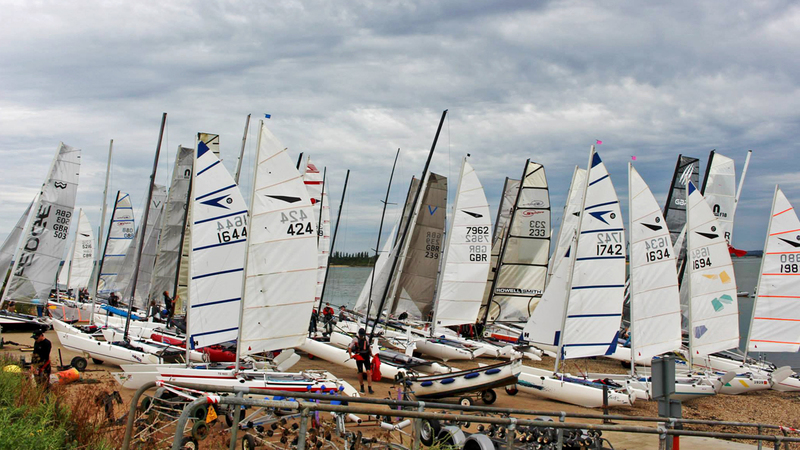 With a fantastic forecast and free camping available all weekend many competitors arrived on Friday evening to set their boats up. On Saturday two races were held inside the River Blackwater starting from 1pm, these were both medium distance to allow for a warm up ahead of Sunday. 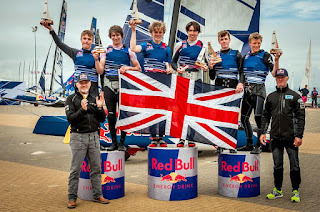 In the first race Olly Harris and his son Ben took the race win sailing their Spitfire catamaran. 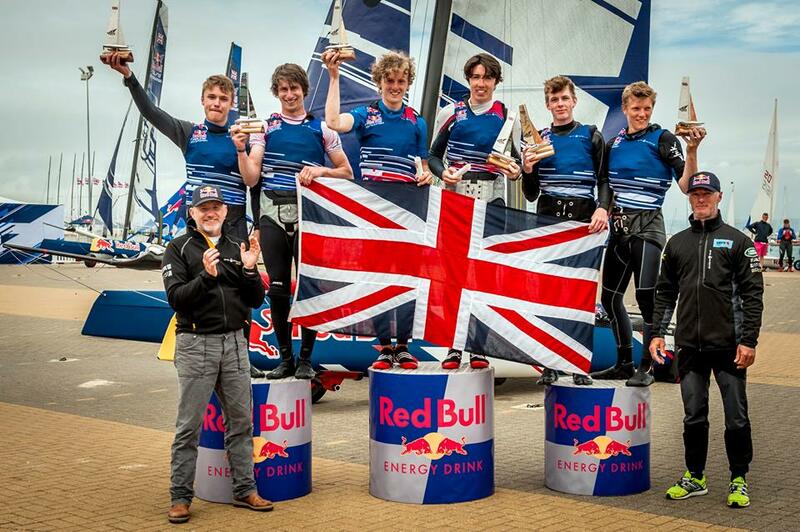 It was Simon Northrop and Sam Van Barker who won the second race. 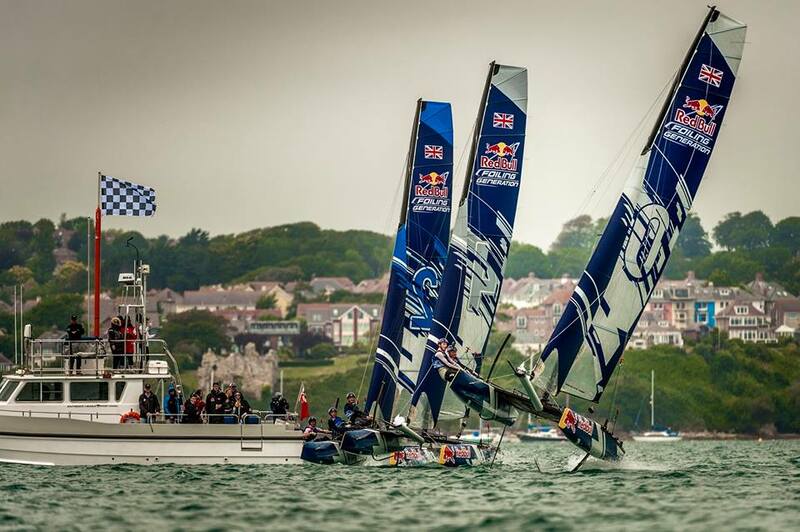 It was a day for the F18’s with the overall races showing an F18 1, 2 and 3. 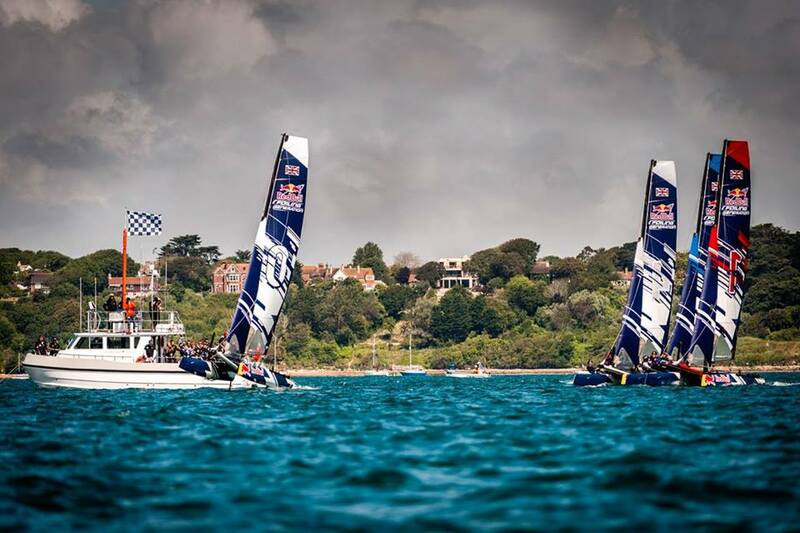 Image: Kiel Week press. 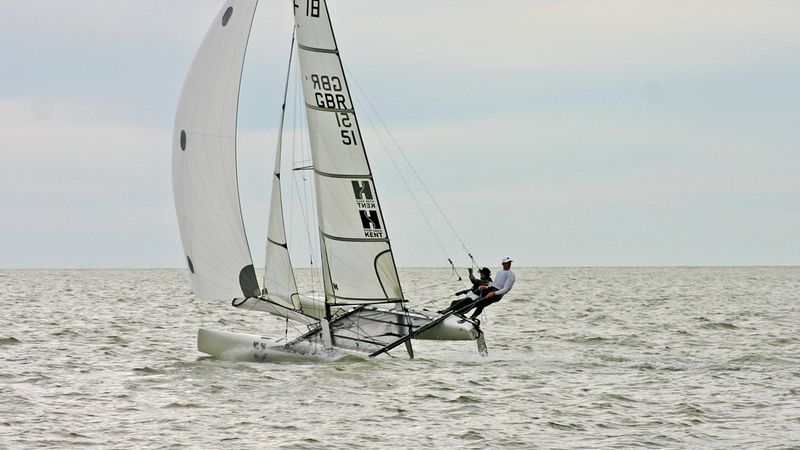 The organization provided the best racing stream so far for any beachcat event, they even reached AC level. 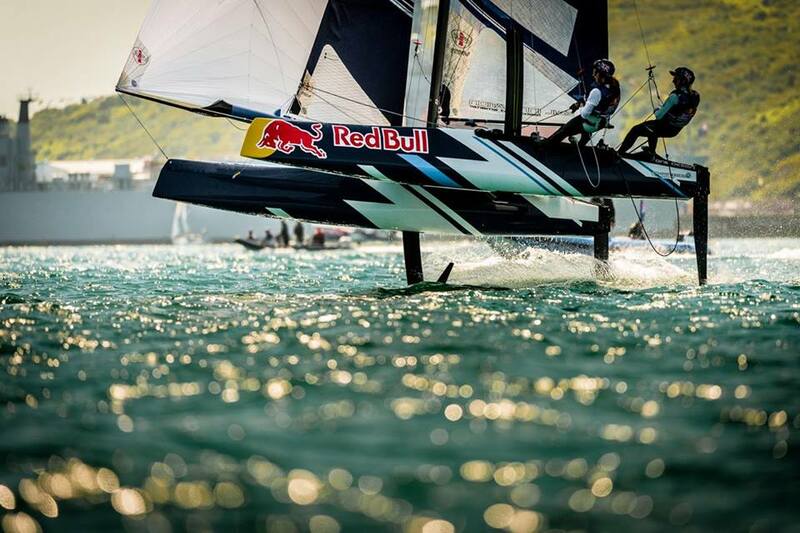 You wonder how X40s or GC32s cannot provide such coverage. Only little critic is the lack of photos, just a detail for the investment made. 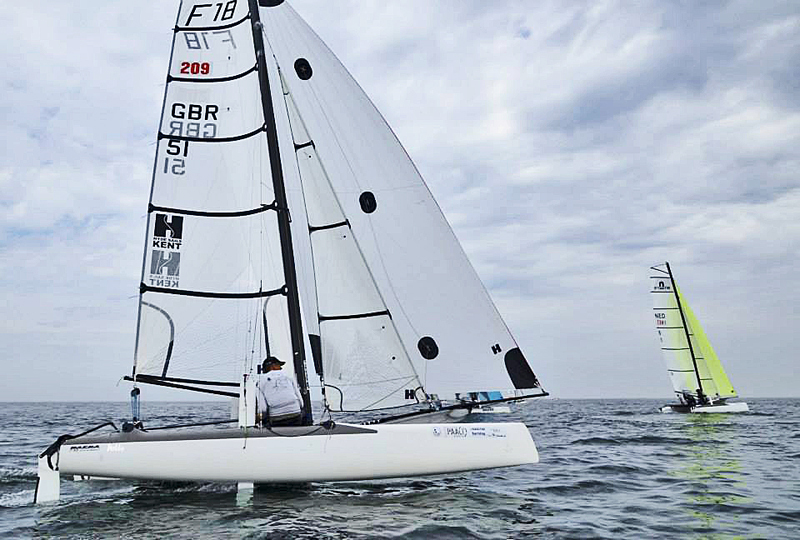 The Sach brothers (Nacra Infusion) are on a mission for the coming F18 2015 Worlds at Kiel beginning July 11th. The best German team and former 2005 World Champs (Held at Germanny sailing a Capricorn) won over Danny Paschalidis- Gustav Dyrssen, also targeting to perform at the next major event, 3rd place for the other German crew with chances to defend the local colors next weeks; Joerg Gosche & Hanns Pegel (Phantom). 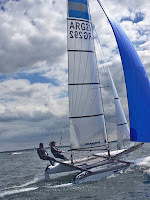 With 200 boats the 2015 Worlds are already a success, having Ashby onboard is pure bonus, Glenn wants his own F18 title as helm (he already have a pair crewing for Bundock). Last year along Brett Goodall they had bad luck with hardware failure giving freeway to Larsen & van West to grab the 2014 title at Ireland. Report by Joerg Gosche: "We were using the SI sails and a Ullman/Pablo kite. Our speed in general was mostly better than the result shows but we are still learning about the Phantom as we were sailing three different F 18 designs (Wildcat, C 2 and now the Phantom) within the last year. Downwind we had great speed under all conditions. Sach/Sach did the best overall performance and their knowledge about the area paid. Dany and Gustav had some great moments. 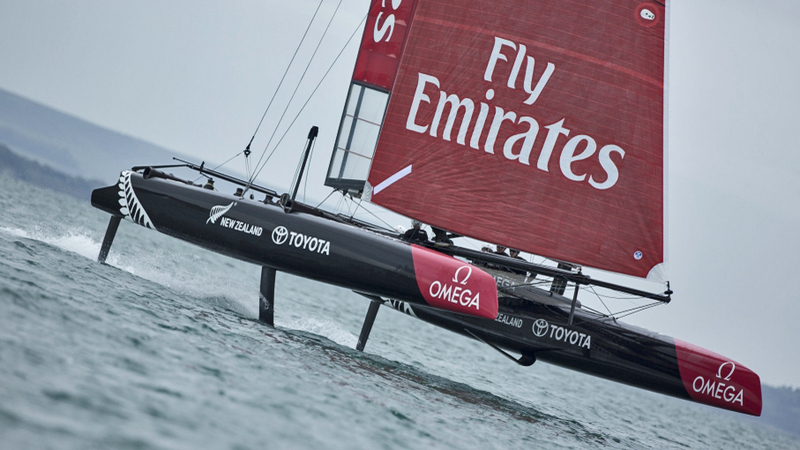 All in all it was a good fleet and great racing but of course the Worlds will be much tougher. We are looking forward to meet the big F18 community here in two weeks. Everything is well prepared." 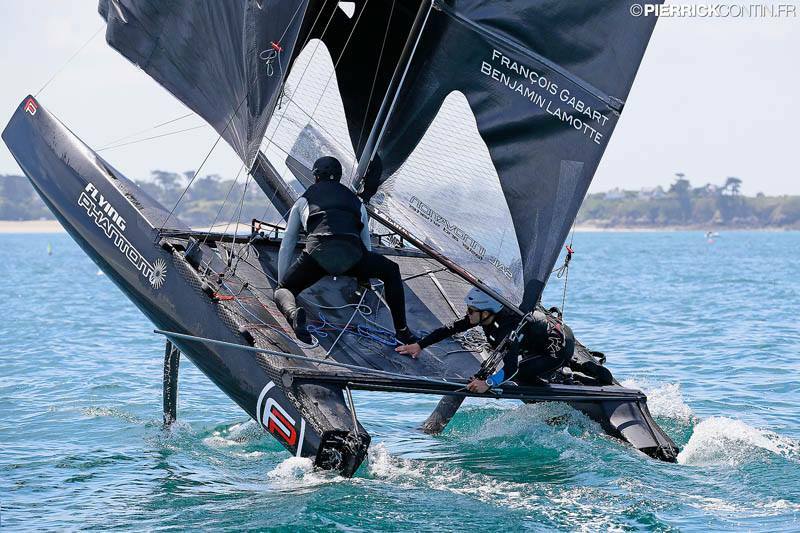 All Images Pierrick Contin, full album at his PF Page - Last pic Gabart going for the foiling gybe in not much wind. 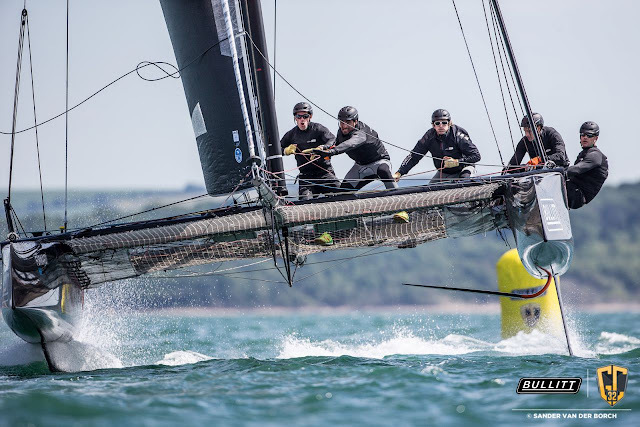 Image by Sander van der Borch - Full gallery at gc32racing.com - Concise 10, a MOD70 won the Round the Island Race within Cowes Week 2015, the GC32s also participated and Sultanate of Oman finished 20mins behind the 70' Trimaran, gap enough to win by corrected time. 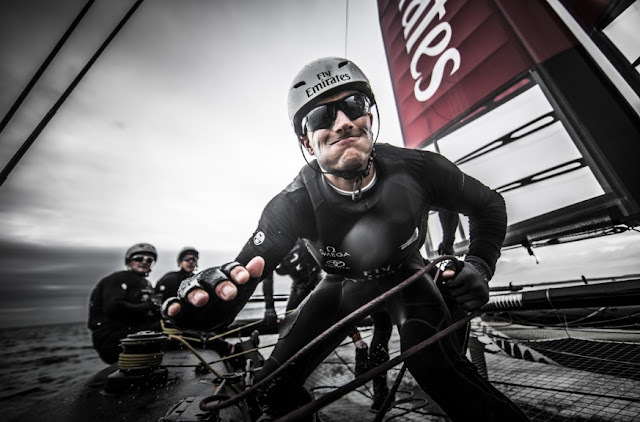 - Elapsed Times , GC32 Racing Tour Report & Video below. 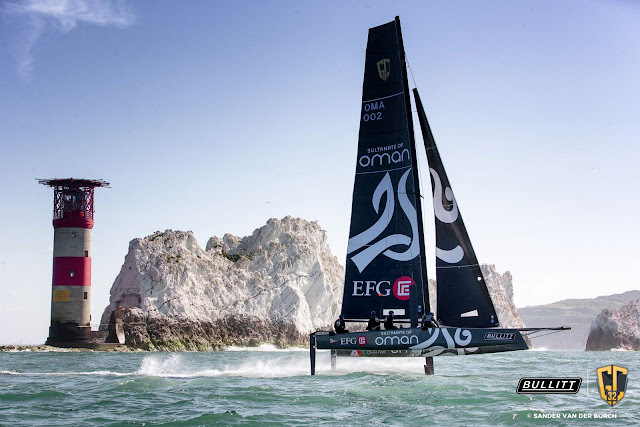 "After the slowest race last year, the GC32s performed admirably in this morning’s spectacular JP Morgan Asset Management Round the Island Race. 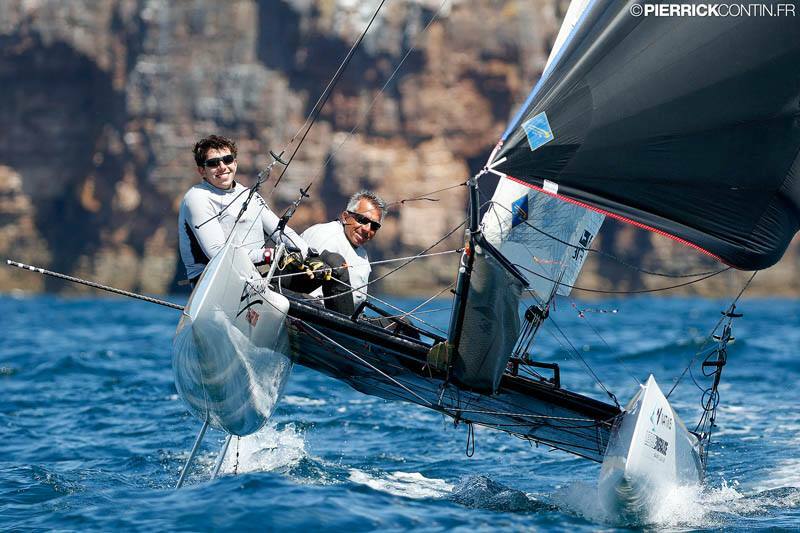 Image: Kiewl Week Media, Sach-Sach overall leaders after 2 races. 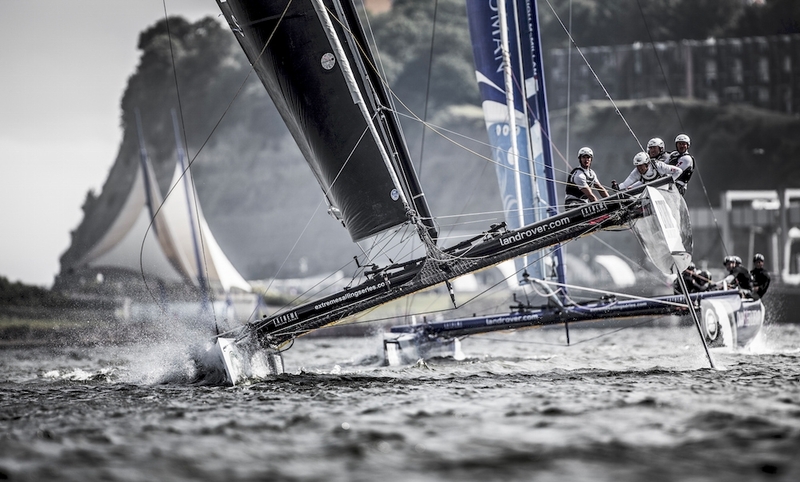 - Yesterday I was consulted on the favorites for Kiel Week and next 2015 F18 Worlds to be held at the same venue in a few days. The contenders for Kiel I sent were those who performed today: Sach-Sach (1,2 - Infusion) and Gosche-Pegel (7,4 - Phantom) and Paschalidids-Dyrssen (dnc-1 - C2). 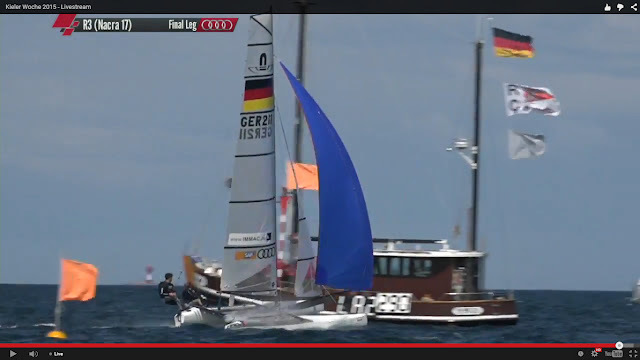 Today at Kiel Week Danes Dahl Nicolaisen-Vogelius scoring 4,3 for a third overall. 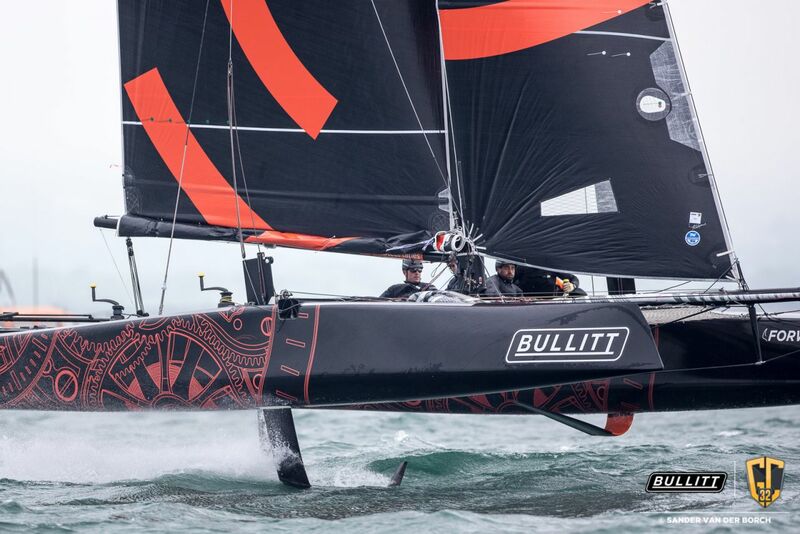 Light winds for the two races, but the stream was interesting to follows as we have lots of 5-6knots races in the Class, Pity not having the new F18 sailing in these conditions, Still waiting for pics to post info on the project. 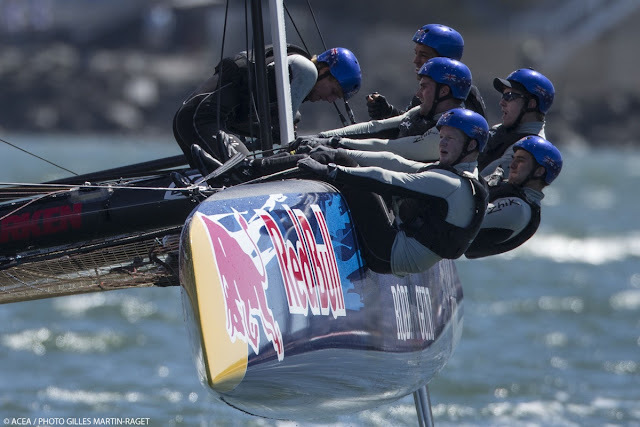 The theory and main goal behind the US A-Class Fleet bid to remove Rule 8 is to retrofit older boats without much investment. 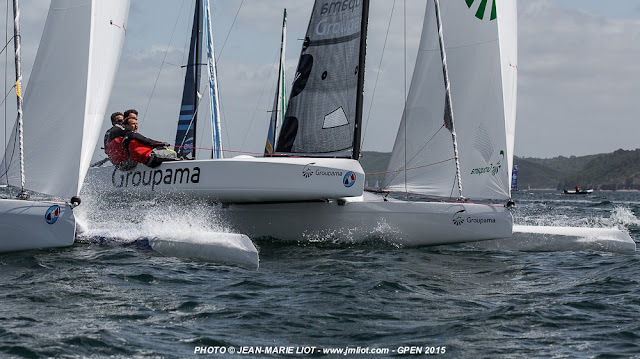 French sailor Bob Fischer has trasnformed the concept into a reality adapting a Bimare 1998 with L/J foils. He achieved excellent results as seen in video below. Launching issues remain (new solutions will arise) and we're still to see how efficient this setup can become on the racing course. 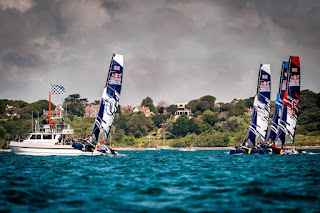 Nevertheless one thing has been proven with his project: Giving new life to A-Cats that wouldn´t have much chances of sailing or racing again is now possible. 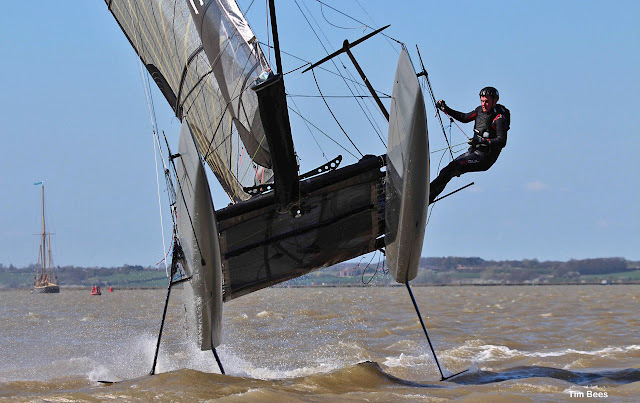 +10yrs old boats can be put back on the water for not much, and if you have / find an older solid platform, a good refined set of foils might convert that older & discarded A-Cat in a fully updated racing weapon. Congrats to Bob Fischer on this project. Below video plus a Q&A on the modifications. - CSN: Who designed & built the foils you fitted on the Bimare 1998? - Which rudders did you fit to the Bimare? - How much money did you invested for the conversion? - How much time did you spent in the modifications? 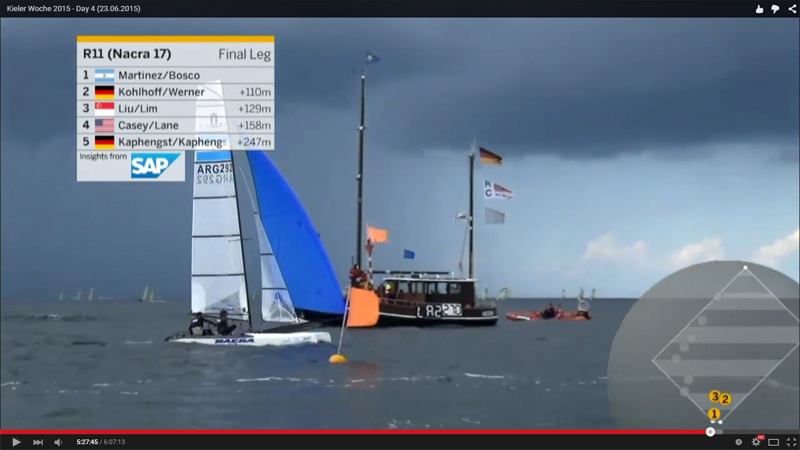 Awesome streaming once more by Kiel Week Org. Stadium Racing??? What is that? 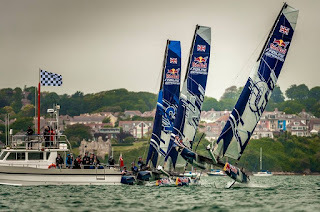 The only thing you need is an average windy venue and this type of Live Streaming, put people in the shore if you want, and add a huge screen for that onsite audience to follow the action as well as remote viewers. 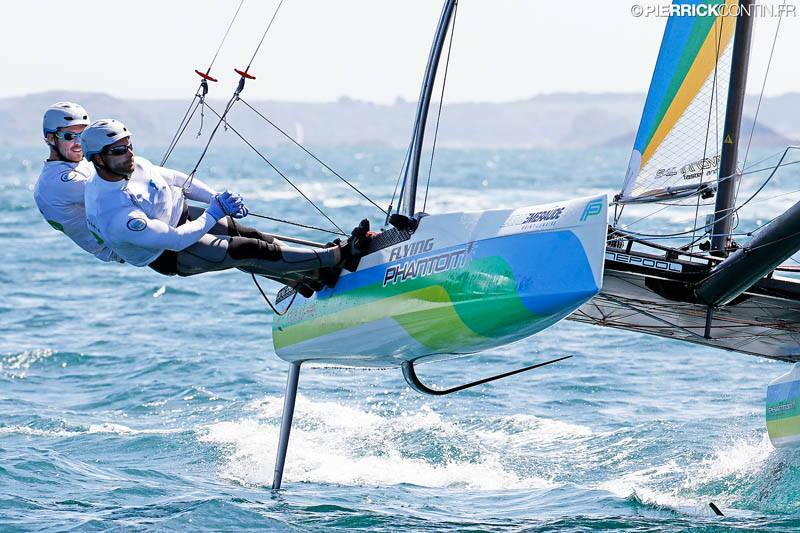 The rookie N17 Argentines had an excellent performance today winning over the almost untouchable Kohlhoff-Werner, second bullet for the Martinez-Bosco, this will boost their confidence plus they'll get even more hooked with Multis as both comes from the 29er fleet. Euge is on her second N17 season though and doing too well for a teenager with not many hours in Multis. 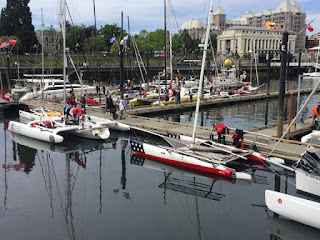 I got really pissed off with local sailing federation when they left her and others without support last year, but she is back and stronger than ever. Great future for her and I hope lesson learned for those managing resources, If you want a future, you better start supporting those putting the hours in current times. 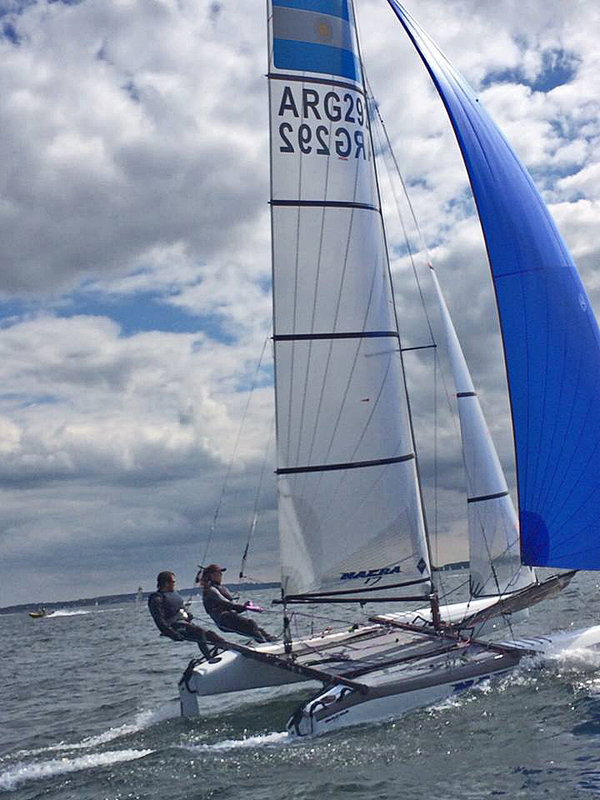 Germans Paul Kohlhof & Caroline Werner are leading the Nacra 17 fleet at Kiel Week 2015 after 9 races. Followed by two Italian crews, in fourth place, the new N17 Arg team of Martinez-Bosco. 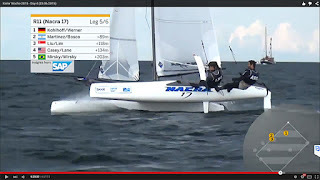 Good championships for them, as a Nacra 17 rookie team, they seem to be grasping the rhythm pretty well, although the top notch Olympic riders are not present at Kiel, there are some experienced cat crews, giving them the boost needed to continue the long Olympic Journey towards Tokio 2020. Andy Rice tells me tomorrow we will have another stream round for the Nacras , follow this link to watch it on Tuesday www.youtube.com/watch?v=2CjS7qxniVM. Not much pics available though, photo above Martinez-Bosco team at Kiel. Full Results here. 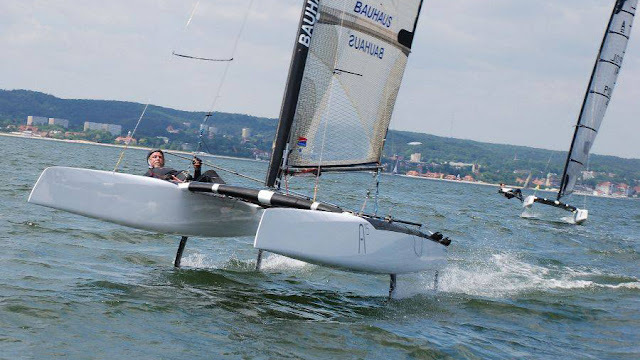 This week the F18s will start racing for a warmup event towards Kiel 2015 Worlds in July. 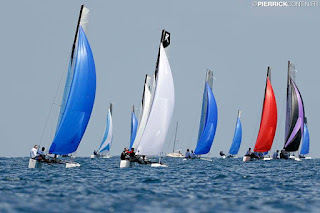 Light Wind machines at Lake Geneva, D35s, Ventilos and many others. I wonder if next editions we can see an allround efficient foiler challenging the Decision 35 fleet. 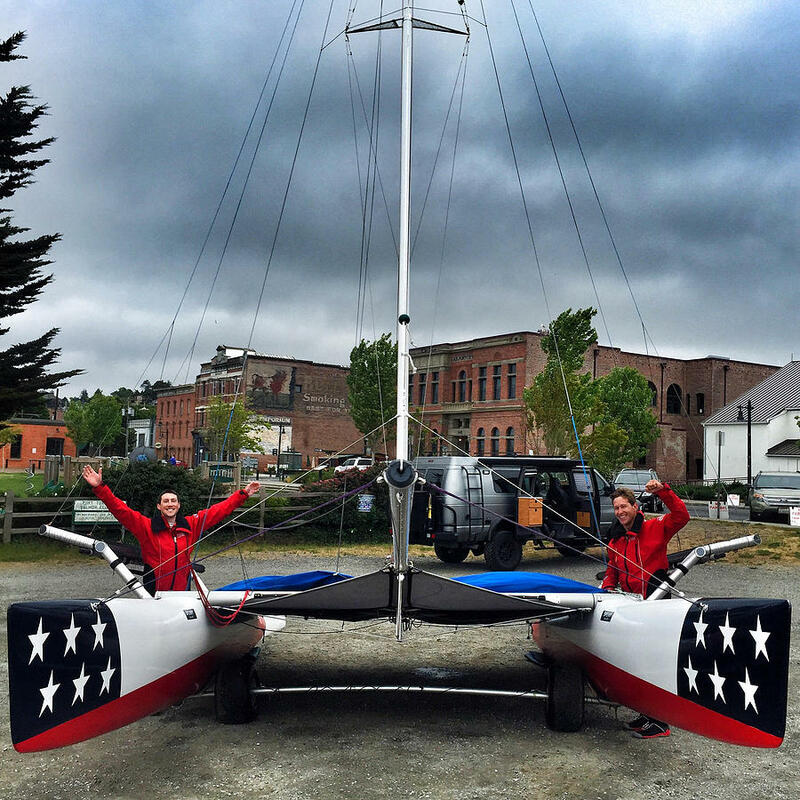 Team Tilt D35 won this year edition, 2014 was for Donna Bertarelli's LadyCat. Watch the video, great wrap-up. 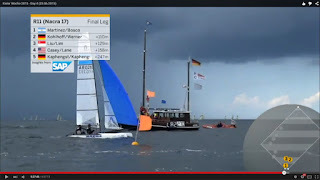 What a nice stream Kiel Week organization provided this weekend, it was AC level on the coverage of the regatta, really good for a local event. 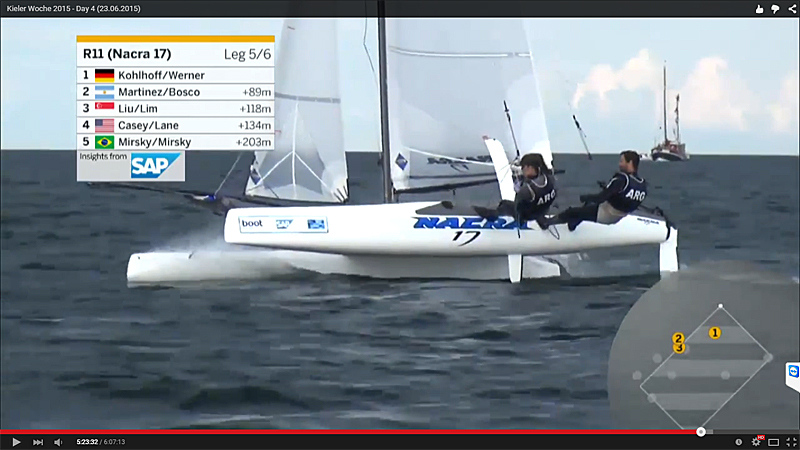 F18 & A-Class , and not even mentioning Nacra 17, Worlds should start offering this kind of Live strem. Sent by Andy Rice, Schedule published here : "There will be some Nacra 17 racing in a couple of hours from now. First is three 49er FX races, then the Nacras afterwards". So happy to see this project being built finally. All rather quite on F18 news awaiting for this. 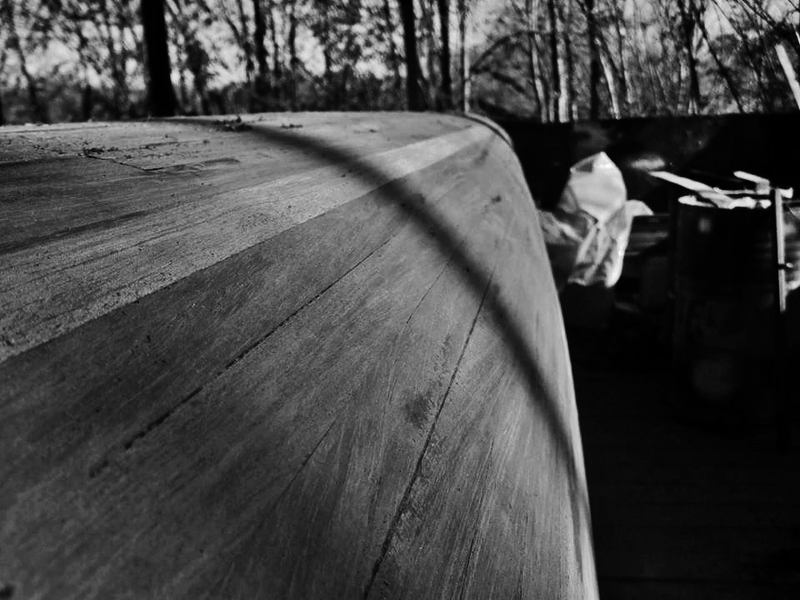 First boat was delivered to a German team, but I'm still checking inbox for 'official' images to publish. Hull Design is the the render you can see above in CSN top Header. More news & details next week. 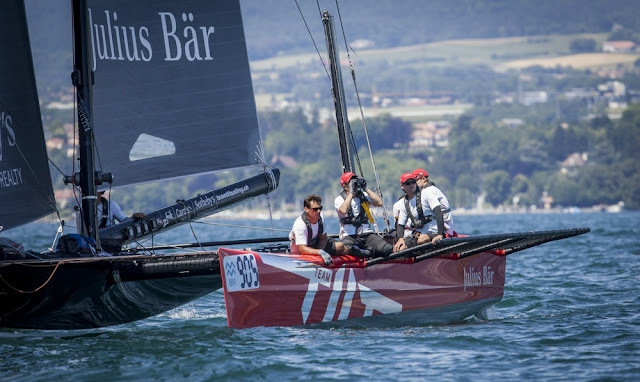 This project will bring new life to the F18 , beyond the great success of Kiel 2015 Worlds with 200 entries, that wrapped 'package' you can see on the left will help to get more boats into the starting line. Well, we worked towards that goal, and the great asset of the Class is that many different hull lines, foils , sail & mast design combos have all a quite even performance in the end, in any case I will sail it at BA 2016 Worlds without a doubt! 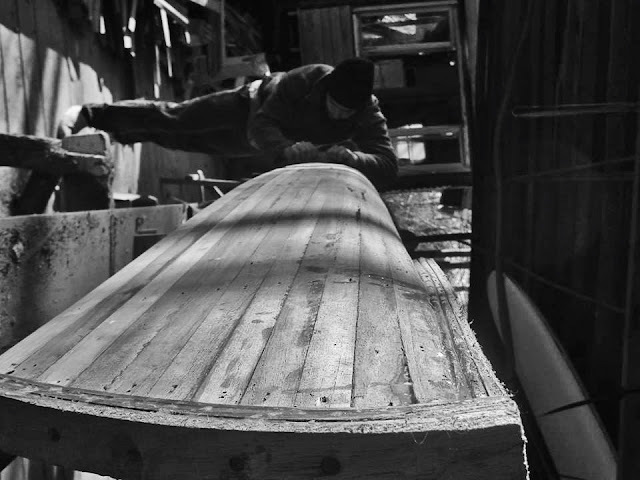 Surfer Mag, RED Direct Series - Filmmaker: Jason Baffa. 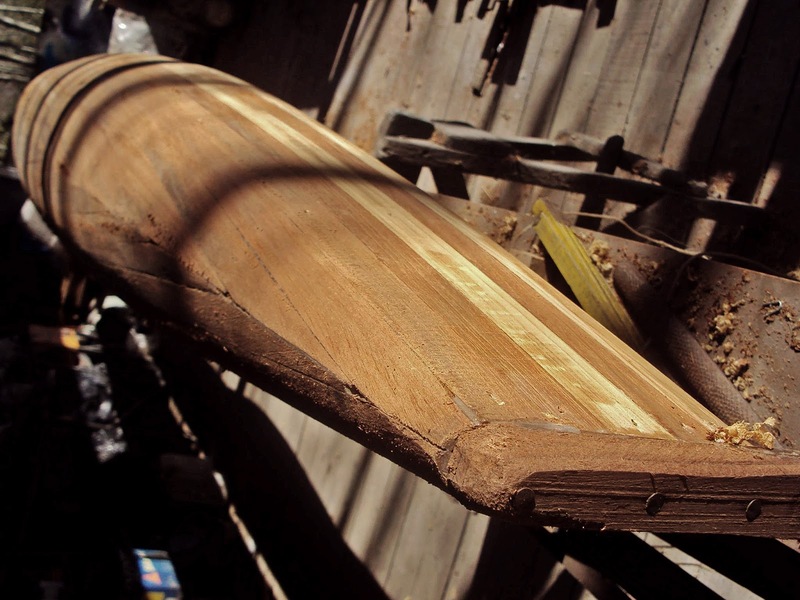 What a nice Shortfilm, I can´t embed so watch it at Surfermag. We need more lifestyle clips in the sailing scene, plenty of good stories to tell. I will try to invest in an another cam to shoot 4k this year at Punta Ala and start playing around with clips (Not a RED cam though!). 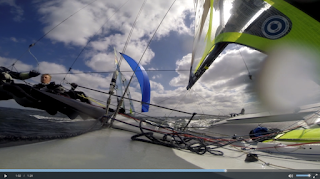 We can launch also a Catsailing Short contest to help promoting the Sport, focused on local stories + good riding shots as can be seen in this film by Jason Baffa showing shaper/surfer Tyle Hatzikian. Speaking of design & building, today I saw the first image of the new F18, exactly the same as the one featured in the top header render here in CSN, can´t wait to sail it. 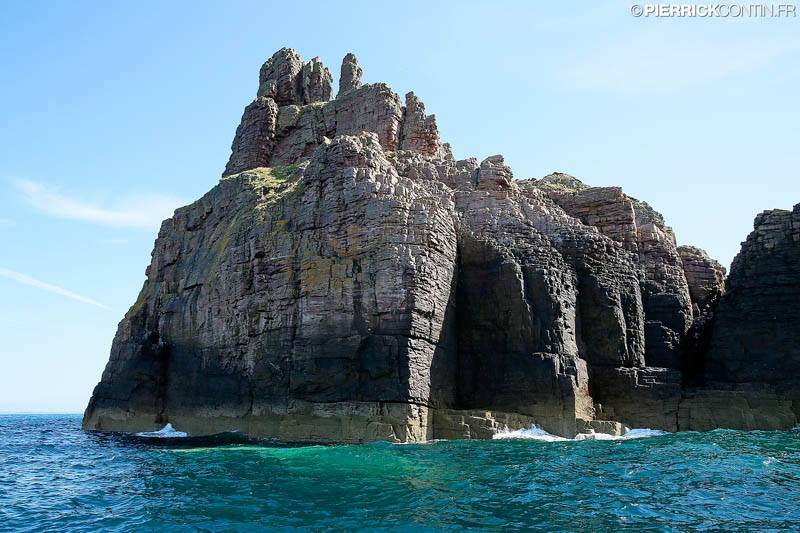 Waiting now for some 'official' pics to publish and share this great project, more info next week. REDirect Surf: Eleven short surf films shot on state-of-the-art RED cameras, REDirect Surf is a filmmaking competition to see who can create the most unique and original surf short of the year. It's a celebration of surf filmmaking and a nod to the technology being used these days to document surfing like never before. Eleven filmmakers were given RED EPIC DRAGON camera packages worth $50K to use for the contest, and the winner gets to keep his. These films promise to be the cinematic highlight reels of the year. Info sent by Andy Rice. Great to have him behind this stream project for Kiel. I remember well how he supported from his web Sailjuice.com, the Tornados when the Dino gang left Multis out of the Games. Andy through Sailing Intelligence is involved in the media fr for this year Kiell Week edition. Some of the biggest names in Olympic competition will feature on the Live TV coverage at Kiel Week, which starts in Germany this weekend. 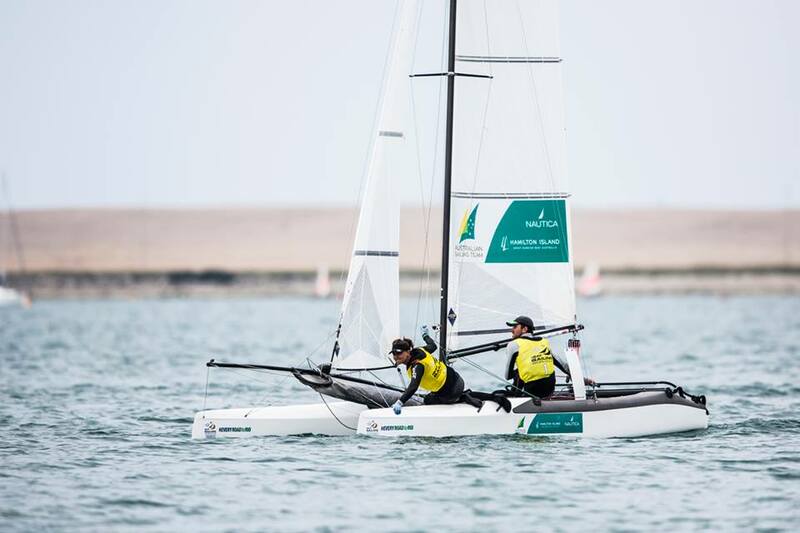 In addition to the full-time Olympic stars, the live TV and expert commentary and analysis provided by SAP Sailing will also offer a rare opportunity for some of sailing’s Corinthian classes to reach a global audience. A combination of aerial overhead shots, side-line course cameras and onboard images from competitors’ boats will bring the 9-day competition alive. 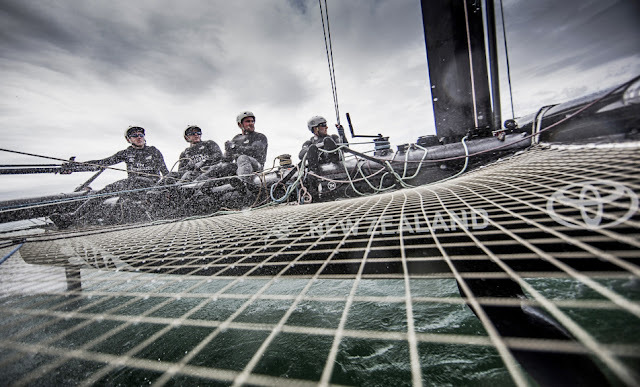 Expert commentators will bring blow-by-blow analysis of the racing, with the help of SAP Sailing Analytics, a vast array of telemetry and GPS tracking that helps reveal who’s fast, who’s tactically smart, and why. 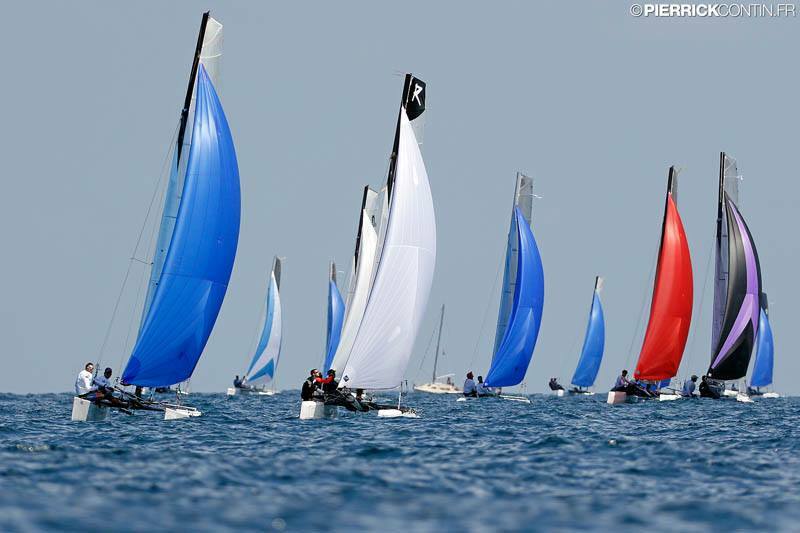 J/80, Melges 24, Platu 25, Albin Express, SB20, 505, Flying Dutchman, J/24, Folkeboot, H-Boat, Contender, OK and Silbernes Band. 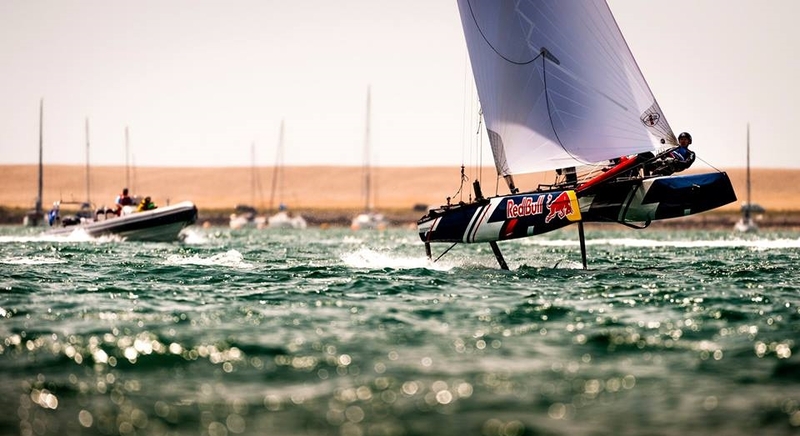 Kicking off the live TV coverage on day one of Kiel Week will be the women in the 49er FX skiffs, and another crash-and-burn class, the new Olympic catamaran sailed by mixed male/female crews, the semi-foiling Nacra 17. It should be a spectacular start to the racing. 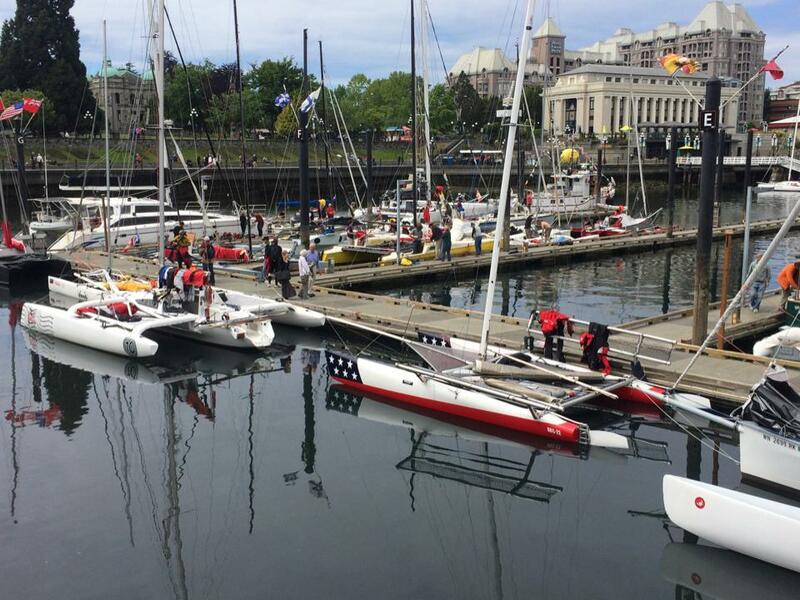 There’s more skiff excitement on day 2 with the 49er skiffs. 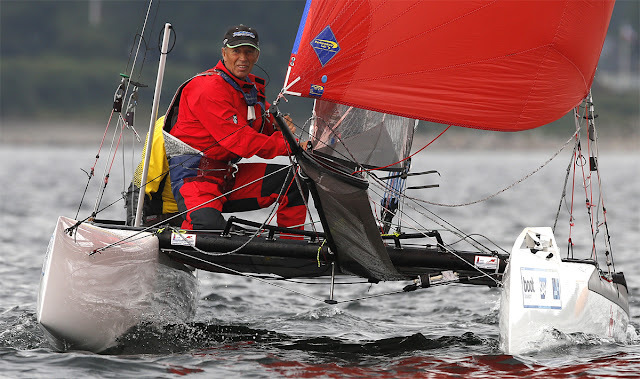 Reigning European Champions Erik Heil and Thomas Ploessel out to defend last year’s Kiel title against the likes of the 2008 Olympic Champion, Jonas Warrer and Anders Thomsen from Denmark. Hiding from the wind in Port McNeill while we make some repairs. Still racing!" "We'll follow the race organizer's lead here, and keep this simple and to the point. Cathartic elation if you can simply complete the course. 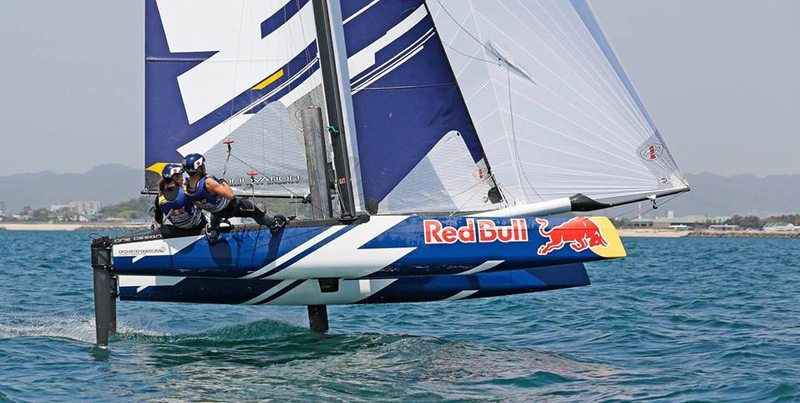 Self-supported race: no supply drops, no safety net. 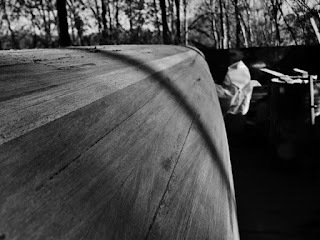 Any boat without an engine can enter. 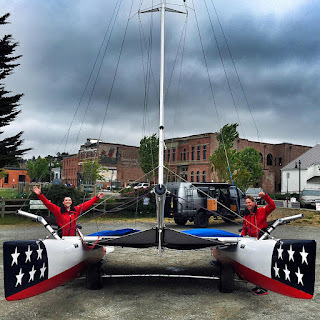 750 cold water miles from Port Townsend, WA to Ketchikan, AK. Cuddly grizzly bears, killer whales, and all sorts of other fun stuff along the way. For us, this race will be the ultimate test. We win? The $10K goes to charity."